Throughout 2012 we are sharing an illustration with you every week to help you to re-imagine the future that you choose. For the twelfth week of 2012 , we are sharing Chris Lonie’s Future. The Future I choose is one where young people are as keen to vote for politicians as they are for x-factor contestants. I chose to illustrate Chris Lonie’s future because I work with a lot of young people. The X Factor really seems to capture their imagination and they get very passionate about following their favourite (or not-so favourite!) acts through the process. The rigmarole and the hype in the run-up to general elections is so very similar, I wonder why they aren’t as inspired by their political candidates. Perhaps because the voting age doesn’t extend to them, they feel it isn’t relevant. It was an interesting development when the Leaders Debate was televised for the first time during the 2010 General Election, but I felt surprised it hadn’t been done before. 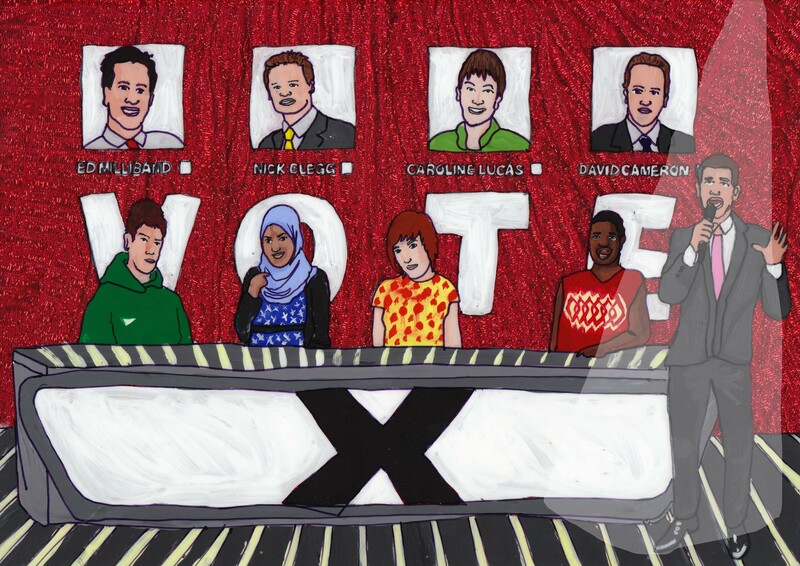 For my illustration, I decided that if we want younger people and first-time voters to be more excited about following the election process, we need to directly lift the X Factor format, featuring them as slightly less polished judges deciding the fate of the candidates against the backdrop of the expectation, booming voiceovers and flashy graphics of the show.